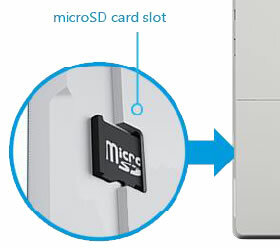 El dispositivo es compatible con tarjetas de memoria microSD (TransFlash) (32 GB máximo). Puedes comprar una tarjeta microSD en cualquier tienda de Verizon Wireless o en la tienda por internet. 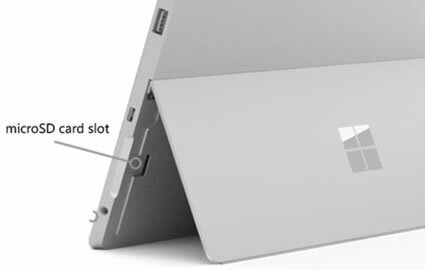 Press and hold the Power button (located on the top edge of the device; to the left of the volume keys) until the "Slide to shut down your PC" message appears then release. From the "Slide to shut down your PC" message, swipe down then allow several seconds for the device to power off. Flip the device over and lift up the kickstand (there is a notch on both sides of the device to use to open the lift open the kickstand). With the gold contacts facing down, insert the memory card into the opening as shown and press in until it locks in place.